The album I've been working on. Avery and I had some together time today. We met a good friend and her son for coffee (hot chocolate for him) and an Adobe Illustrator demonstration. Then we went to Boston Market for a little lunch and more chatting. He had a birthday party to go to at 1 for a set of twins in his class. It was a BUG birthday…can you imagine how Avery felt about it?? The boy was so excited! After cake and ice cream, the party went over to The Butterfly Pavilion. We looked at all the bugs and spiders, Avery held Rosie (the resident tarantula), and we watched a butterfly release. I think that he would say he had a great day. And now I get to share with you the album that I have been working on for little over a week. 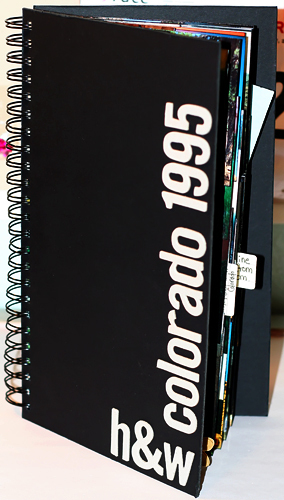 I had decided that I wanted to make a “mini” album with *all* of the pictures from our first trip to Colorado in 1995. (Because I just couldn’t pare them down!) When I started working on this album last week at the crop with my friends, they all warned me that it wouldn’t fit in one album…I would need to make two volumes. I decided that I needed to find a way to “make it work.” (Thanks, Tim Gunn!) 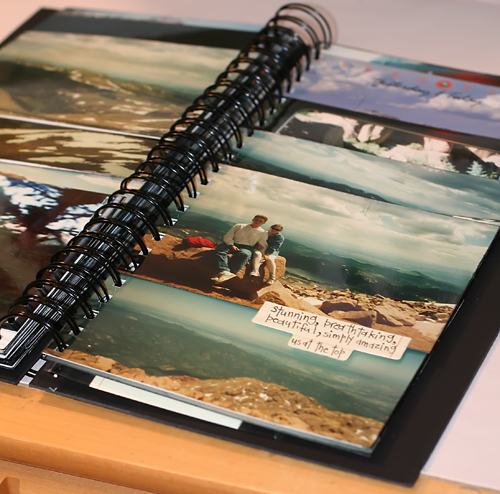 Instead of the 7×7 album that I started with, I ended up with a 12.5×7 album. I love it! 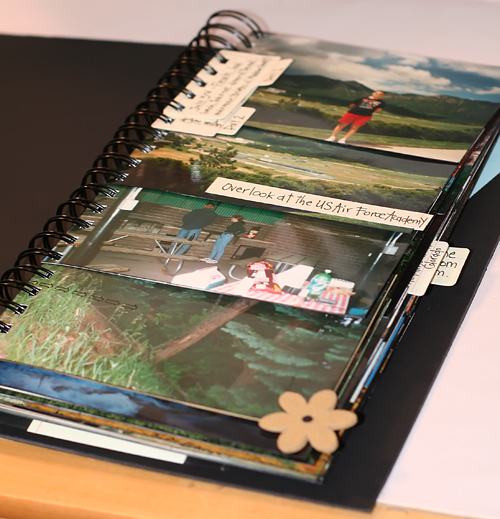 I used some journaling that I wrote when I originally put the pages in a photo album, and I added some journaling to some of the individual photos. 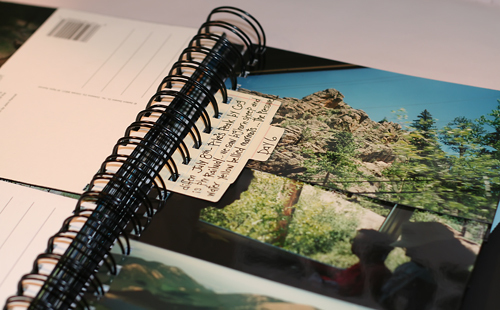 The tabs that have the original journaling and separate each day. One of the few pics of the two of us from the whole trip. 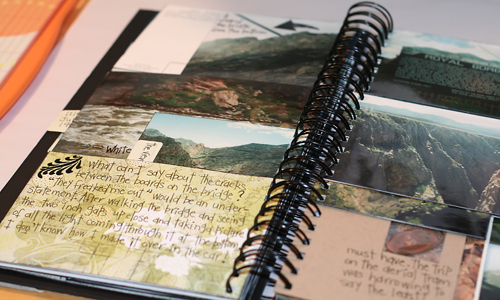 And now….on to the next project! Go Heather! 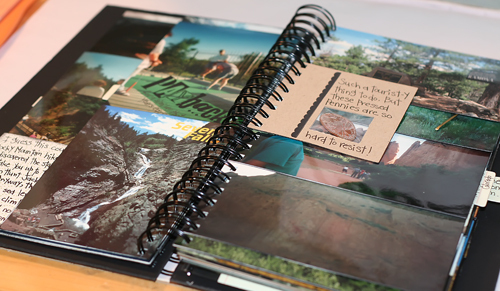 You inspired me so much on that night to just get my photos out there, so I took off with making yearly adventure albums, 2006 is almost done and I pared down to make it all fit in a 4×6 size, I really wanted to keep it small for little hands, but I LOVE the tall and skinny look of your album. I will try to post some pics tonight of my take on your BRILLANT idea! PS How did you get the pennies in there? I would love to put some in a few older albums. Look at you, rockin’ that Bind It All! I don’t suppose I could display that for a little while, as an example of thinking outside the Bind It All box??? this is wonderful in every single way imaginable. i am very impressed at your ingenuity to get a single album. it’s very fun to look through, at least what we can see here. good for you!